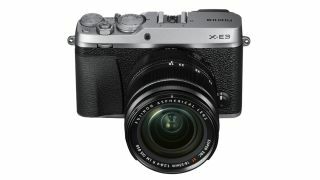 Fujifilm has broadened its acclaimed X-series camera line with the new X-E3. The X-E3 follows last year's X-E2S, and combines previously seen features from the X-Pro2 and X-T2 with a few new additions. Notably, the camera is the first Fujifilm X-series model to gain Bluetooth Low Energy, which allows users to transfer images to mobiles and tablets in a power-efficient manner. Fujifilm is one of a number of companies that have fitted their own models with this technology, and here it’s joined by the same Wi-Fi option that has been included on the company's other cameras. In place of the X-E2S’s 16MP X-Trans CMOS II sensor, the new model also gains the latest-generation X-Trans CMOS III technology. The sensor offers the same 24.3MP pixel count and APS-C dimensions as other interchangeable-lens X-series cameras, and this works in partnership with the X-Processor Pro engine. This replaces the older EXR Processor II, and brings 4K UHD recording to the X-E line for the very first time, recording at frame rates up to 30p. Full HD recording is also possible, while a microphone port around the camera’s side allows for external microphones to be plugged in for superior audio capture. Although the camera's 3in, 1.04million-dot, fixed LCD screen appears the same as the unit on the X-E2S, Fujifilm has now added touch functionality. This features recognition for smartphone-like gestures such as double tapping and pinch-zooming actions, and you can also now call upon pre-determined actions by simply flicking the screen in up-down and left-right directions. The autofocus system has also been revised. According to the company, a newly developed image-recognition algorithm means the camera is now able to track moving subjects twice as fast as previous models. The camera also now gains the popular Focus Lever seen on other recent Fujifilm cameras, which means the focus point can be easily moved around the frame. Other features include the familiar Film Simulation modes such as Classic Chrome and Velvia, together with shutter speed and exposure compensation dials, and support for SDHC and SDXC cards (up to the UHS-I standard). The Fujifilm X-E3 will be available on body-only and kit options, in black and silver finishes, and will have a release date of 28th September. The body alone will cost £849/$900, while a kit with the 23mm f/2 lens will set you back £1149/$1150/AU$1,799. A further kit with the 18-55mm lens will also be available at £1249/$1300. The company is also planning on releasing a case for the new camera and a metal hand grip, and these will retail at £74.99 and £119 respectively.